Luton boss Mick Harford was named the League One Manager of the Month for March. The 60-year-old led Town to victories over Rochdale, Bradford, Doncaster and Bristol Rovers, plus draws with Plymouth and Gillingham taking the Town level with the club record for unbeaten league matches, the 27 set in the Conference-winning campaign of 2013-14. The new record of 28 league matches without defeat was reached last Saturday in the first game of April, and Mick has seen off competition from AFC Wimbledon boss Wally Downes, Oxford's Karl Robinson and Lee Bowyer of Charlton, to win the first manager of the month award of his long and distinguished career. After having his pictures taken with the trophy after training, Mick took it to every area of The Brache in which his players and colleagues on the staff were situated - to tell them that the award was theirs. Speaking about the prize, he said: "It’s an honour to accept the award on behalf of the football club, and that’s what it is – it’s for the football club. "When I took the role I wasn’t in it for any self-gratification, it was a case of coming in to help the football club and try to put it in a better place. "I think that we as a group have achieved that. “But mainly, this award that I am accepting on behalf of the football club, is mostly down to the players. 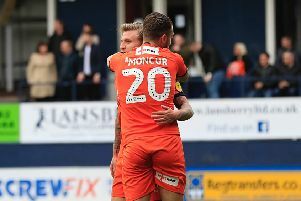 The Sky Bet’s judging panel chairman George Burley said: “Mick has maintained Luton Town’s remarkable momentum in a very busy unbeaten month.